Will Libertas steer clear of the UK? 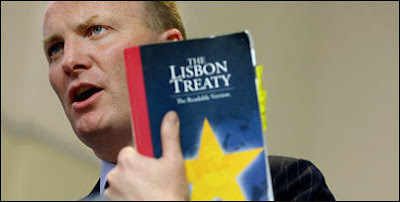 On the eve of Declan Ganley announcing the transformation of his anti-Lisbon Treaty pressure group Libertas into a new pan-European party, the press are giving the impression that Ganley has scaled back what was rumoured to be his original idea of contesting the European Elections in virtually all EU member states. Though of course the article may not be 100% accurate, the fact that it only names six countries in which Libertas is likely to be competing in is good. Ganley may have come across as something of a eurosceptic - and I am greatful for his funding towards the "no" campaign in Ireland - but the fact remains that he is still fully fledged supporter of the European Union. And the worrying danger always was that Libertas would seek to run a well funded campaign in the UK which would diminish votes from the only true eurosceptic cause in Britain, the UK Independence Party. That would have been very bad news indeed for the eurosceptic cause. Libertas seem to have reached deals with MEP's like Frenchman Phillip de Villiers and Dane Jens Peter-Bonde - both of whom have parties currently aligned with UKIP in the Independence and Democracy group. It seems likely that Libertas, if successful, will seek to form a anti-Lisbon parliamentary grouping in the next European Parliament. That will probably lead to the break-up of the IndDem group and would most likely leave UKIP's MEP's as Non-Attatched. If that is what it takes for Lisbon to be stopped in its tracks and for the subject of the EU to once again be put across as a relevant and important subject to the people of Europe, then I am willing to accept this as a consequence. The one big remaining threat that Ganley poses against the eurosceptic side is a potential deal with the British Conservatives, which would include an endorsement and plus funding. An anti-Lisbon ticket in the UK between the two would make sense and could perhaps give David Cameron an in to the new European parliamentary grouping he has supposedly been after. How many more times does it need to be said? The EU is an in or out debate. The Conservatives are as useless as Labour. The Tories might make slightly different noises - but this current leadership has no appetite for fighting for the retrieval of Britain's democracy - and neither does Declan Ganley. Effy is new to blogging and feels strongly on the issue of Britain's relationship with the European Union, arguing that Britain would be Better Off Out.